After planes struck the World Trade Center on the morning of September 11, 2001, Chicago Mayor Richard M. Daley enacted a semi-voluntary evacuation of downtown, and businesses across the city sent their employees home from work. Q Kiser, a musician from the Pullman neighborhood, was among the evacuees. Facing the gravity of 9/11, Q wondered how long it would take if the city really had to evacuate — if an atomic bomb hit, for instance, or a freight train accident unleashed a chlorine gas cloud. Or, you know, zombies. He immediately thought about every zombie movie he’d ever seen. Planning to move Chicago’s 2.7 million people past the city limits to a safe location as quickly as possible might seem far-fetched, or even paranoid, and yet with a mass-casualty incident in the news every week, it’s clear that Chicago — which has itself experienced 50 of the deadliest disasters in U.S. history, most recently the 1995 heat wave, which killed over 700 people — needs to be ready for the unthinkable. Yes, there is a plan for evacuating Chicago, but answering Q’s question — how long would it take — is tricky, for reasons that say a lot about the city’s preparedness, and a veil of secrecy surrounding homeland security agencies. The biggest obstacle to estimating how long an evacuation of Chicago might take is this: The city does not share the bulk of its plans with the public. We do know the city has two plans: the Chicago Emergency Operations Plan and the Central Business District (CBD) evacuation plan. Public documentation of the former doesn’t exist. Public documentation of the latter is both out of date (the last post hails from 2007) and it’s skimpy on details, apart from broad duties spread among a large number of agencies. More importantly, though, the lack of public knowledge about the plans also means security experts and community groups can’t assess or critique estimates. We were offered just two estimates about evacuation estimates that even begin to answer Q’s question. The first is listed in a 2009 study conducted by the Illinois Terrorism Task Force. The authors project that 180,000 cars could flow out of Chicago’s Central Business District in 3 hours. This estimate, though doesn’t squarely address Q’s question about evacuating the entire city, and there are other problems with it. Among them: The three-hour figure doesn’t address the vast majority of cars within the entire city (there are more than 1.3 million cars registered in Chicago, according to the Illinois Secretary of State’s website). It also doesn’t address the fact that — according to U.S. Census estimates — more than a quarter of the city’s households report that they not have access to a car. The other concrete estimate we received from a government agency comes from Thomas Korty, the Administrator of Homeland Security and Emergency Management at Illinois Department of Transportation (IDOT). He says IDOT anticipates being able to evacuate Chicago within two or three hours. IDOT refused to grant follow-up interviews to clarify the methods and assumptions used to arrive at this estimate, which several experts characterized as low. One of them, Tim Lomax of the Texas Transportation Institute, wonders about the math. “I really doubt if you could evacuate a major city in less than 12 hours,” he says. Most experts agree that no major American city can be evacuated in less than 12 hours, if they can be evacuated at all. New York’s Emergency Management Agency expects it would take upwards of 12 hours to complete a citywide evacuation. There’s also the real-world example of Houston, Texas, roughly the same size and population of Chicago. In 2005, 2.5 million people fled the area as Hurricane Rita approached. Citizens had just watched the devastation of New Orleans by Hurricane Katrina a few weeks prior, so almost everyone left, resulting in the largest evacuation in U.S. history. The ensuing gridlock stretched hundreds of miles, and drivers were stuck behind the wheel for up to 24 hours. Eventually, Houston Mayor Bill White started calling the highways “a deathtrap,” and urged people who had not left to shelter-in-place. Up to 118 people died in the Rita evacuation, from car accidents and the heat. That’s more than ten times as were killed by the storm itself, which caused little damage to Houston. The point is: A city nearly the same size as Chicago, that had advanced notice and a motivated, prepared populace, took 24 hours to evacuate, and many died in the process. Chicago, on the other hand, plans for no-notice disasters such as tornadoes and terrorist attacks — crises that happen without warning. That puts the 2-3 hour evacuation estimate in the same realm of possibility as a zombie apocalypse. Maybe even a little less likely. 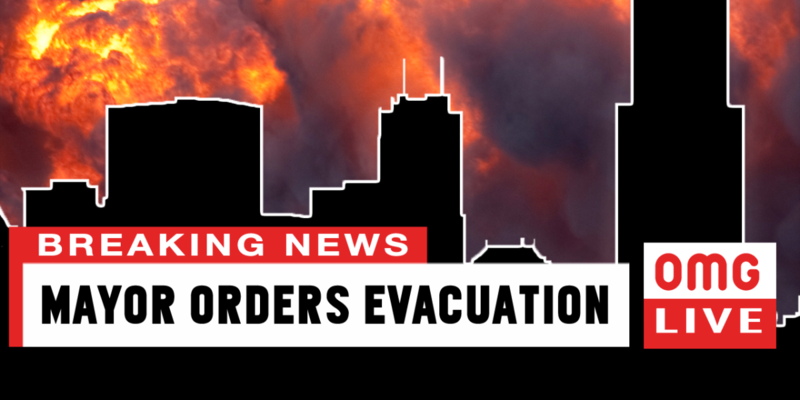 Chicago’s Office of Emergency Management and Communications (OEMC) won’t confirm, deny or clarify any city-wide evacuation timing estimate: beginning with IDOT’s 2-3 hour figure, or estimates in the 12-plus hours range. But they do point to their website, which has tips for drafting a family emergency plan, preparing a “go bag” of essential items, and avoiding chemical exposure. There are no lists of evacuation routes or shelters, however; nor are there estimates of how long residents should plan an evacuation to take. The OEMC’s Managing Deputy Director of Operations, Rich Guidice, says the agency keeps such info confidential so the city does not send evacuees to unsafe areas. They don’t want you to go to a shelter that is closed, or doesn’t have food and supplies, or is in the middle of a toxic cloud. The city is also concerned that if the routes and locations were released, terrorists could target those routes and shelter locations. The OEMC workshops its evacuation plans with the police and fire departments, utility companies, the Red Cross and regional transit agencies. Those plans have actually seen some action. Partial evacuations have occurred for incidents like the 1992 underground tunnel flood, which caused a power outage downtown, and the 2008 flood of the Albany Park neighborhood. The music festival Lollapalooza has been evacuated twice in the past five years due to weather. The city also holds evacuation drills. In 2006, OEMC staged a massive mock evacuation of downtown. Emergency services participated in the evacuation of four downtown buildings with more than 4,000 citizen volunteers. They later used footage from the event in an instructional video to help office workers prepare for disasters. It’s clear the city has had a lot of practice handling evacuation, both real and hypothetical. That should instill some confidence. However, some emergency preparedness experts believe secrecy can be problematic. According to Dr. John Renne of Florida Atlantic University, the hardest part about evacuating a city is educating people about what to do. Disasters can make cell reception and electric power unreliable. Renne and others say when either of those services fail, it’s difficult to inform people about evacuation routes and pickup spots. A former resident of New Orleans who evacuated during Hurricane Katrina, Dr. Renne studies emergency planning and preparedness all over the country. He’s worked extensively with Chicago’s transit agencies and emergency managers, characterizing them as “overconfident” and unusually guarded in their planning. Granted, those are “hurricane cities,” and their emergency managers maintain some level of secrecy. Yet, the openness and engagement around their evacuation plans is undeniable. New York created an interactive map of hurricane evacuation shelters, and it uses social media raise awareness of preparedness. They also have a mascot: Ready Girl, a superhero who travels to schools, teaching students how to be prepared. New Orleans has installed sculptures marking evacuation pickup spots, and Miami makes its emergency plans public. It seems Chicagoans could really use Ready Girl’s preparedness powers because, according to Council for Excellence in Government’s Public Readiness Index, residents don’t have a clue. About 80 percent of Chicago’s citizens do not have a set place to meet during a disaster, or a communications plan; 48 percent do not know where to get information; and 41 percent have taken no steps to be prepared. Compare that to 7 percent in Miami. If Chicagoans are unprepared and uninformed, that could drastically affect an evacuation timeline. So this question of how long a citywide evacuation might take — whether it’s two, 12, or 24 hours — may not be the one that actually counts. Instead, ask yourself: If the unthinkable happens, do you know where to go and what to do? How will you reconnect with your family? What if there’s no electricity? No cell service? What if you don’t have a car? Or you’re elderly, disabled, or in prison? How will you escape from Chicago? A citywide evacuation of Chicago would take place under circumstances so cataclysmic, they’re practically unimaginable. Still, if the residents knew more about the plan, and what resources will be deployed, they might be better able to follow government instructions, as well as pitch in and help. Either way, the city’s current policy essentially requires that you trust them, which these days might be a lot to ask. Q Kiser plays and teaches music on Chicago’s South Side. Regularly gigging around town with his band The Hat Guys, Q works days with Intonation Music, educating 3rd to 8th graders in the ways of rock (and pop). Q says he plans to follow the city’s advice for an evacuation, which is, ironically, to stay put: Shelter-in-place for 72 hours, until emergency services can reach you. After that, though, he and his wife Ann Marie will start walking, towards their families in Indiana and Michigan. They’d put their four cats in carriers and bring them along. Unfortunately for Q, pretty much the only detail we learned about Chicago’s evacuation shelters is that they do not allow pets. John Fecile is an independent filmmaker and former Curious City intern who swears he's not paranoid. Follow him at @JohnFecile.